So, it happened again. Someone asked me to make a guitar strap with the initials like John Mayer's. The request, oddly, is always accompanied by this picture, and it's never a request for an exact duplication, just a variation on my monogram guitar strap. I always say yes - what difference does it really make which way someone wants the initials to be formatted? Years ago I wrote a blog post on monograms, since I was getting quite a few requests for monograms in various formats and I thought that, if I were going to be offering pieces with monograms, I ought to be able to distinguish when to use which monogram style. When I started researching I found that the larger last initial in the center, flanked by smaller first and middle initials, is the traditional style for a woman. It's also used for wedding monograms (with the bride and grooms initials on either side, though I can't honestly remember which goes where). Men's monograms are first-middle-last, all in the same size, the way I've always done my Monogram Guitar Straps. 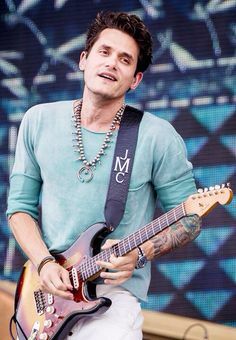 Even though I know it's not the technically correct way to monogram, I've added the "Mayer" option to my Monogram Guitar Straps -- and I'll make an open offer to John Mayer -- if ever you'd like a guitar strap with a properly formatted men's monogram, I'll make you one, free of charge.